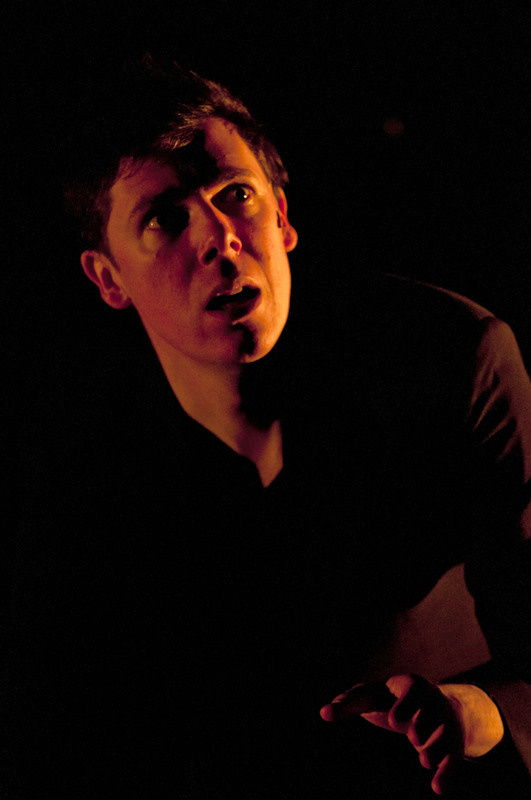 On the surface, Damien Atkins’ one-man show We Are Not Alone is about a man’s experiences writing a play about UFOs and alien encounters. At a deeper level, it addresses questions of belief, what allows belief to happen, and the longing for certainty. Unlike many things that run in a spectrum, attitudes to the supernatural tend to be ultimately binary, putting people into the believer or skeptic camps. The gulf between can be too wide to traverse, even when that perspective is challenged to its limit. 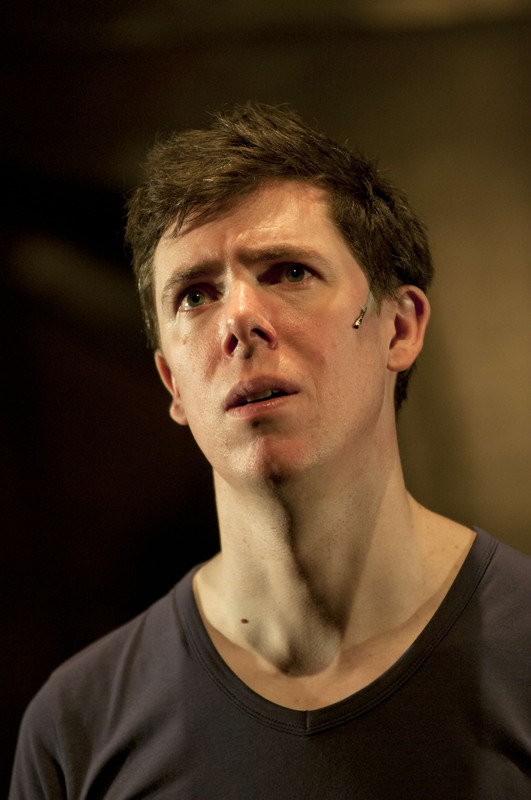 The play consists of four parts, each of which switches between Atkins’ narrative thread about writing the play and characters that Atkins brings to life on stage. The show starts with a quick tour of known UFO sightings (Roswell, for example). Then it transitions into a presentation of known evidence for the existence of UFOs. The play then shifts gears to Atkins’ attendance at the International UFO Congress in Arizona accompanied by his director Chris Barry and the ends with their journey to Sedona, a desert park known for its vortexes and unusual energy levels. The first two parts of the show are like watching the most compelling documentary on the topic ever made. At rocket speeds, Atkins zooms through events. He recreates the historic feel of past eras with a single prop of a standing microphone and marvelously agile voice and body work. His re-enactments of people running around with Geiger counters, Tennessee lawmen, pilots, mothers shouting at Little League games, and even an author he skypes are vivid. No matter who he portrays, Atkins ceases to be Atkins and the characters materialize before us in three dimensions and make contact. If I wanted anyone to teach me the facts about UFOs, I’d skip the books, the films, the documentaries, the podcasts, and go straight to Atkins. Although these stories and characters are fascinating and Atkins very funny, I found this initial section hard to connect with dramatically. It was wonderful as an overview of facts, but it also felt like an obligatory prequel. Atkins is walking us through his initial research, trying to explain why he was drawn to the topic. Yet, it was less about Atkins and his story, and more FYI for the audience. Only when Atkins heads to the conference does his real journey, an archtypical heroic journey, start. The four-day conference puts Atkins in the path of experiencers, people who have had an encounter with an ET. Here the audience sees the complexity of Atkins’ problem: he wants to believe, yet those who do are, for lack of a better word, weirdos. The things the experiencers claim to have seen or gone through sound absurd and/or creepy and/or attributable to something else like a psychiatric disorder. Furthermore, there is a mismatch between all the pain, confusion, and terror that go with the encounter(s), and the positive attitudes the experiencers maintain. What kind of encounters do I mean? Being used for experimental half-alien/half-human babies, having devices planted, getting scars. In the face of these personal revelations, Atkins expresses tangible confusion. He struggles with his desire to understand, his instinct to dismiss, and his fear that it could be true. Atkins is terrified to have an experience, yet longs to. He wants to believe, yet he doesn’t know how. In one of the most profound moments of the play, Atkins runs into a metaphoric brick wall: those who require concrete proof of alien existence are denied the answers they seek. The universe doesn’t reveal her deepest secrets to those who wish to understand her for the purpose of mastering her. Again, the audience is treated to Atkins’ strength at embodying diverse characters during his time at the conference. Whether playing his up-for-anything director, a gentle hippie who hangs with Yetis, or an egocentric crop circle documentarian, he crafts complete individuals. No two move or speak alike, so this one-man production feels like a cast of thousands (okay, maybe a cast of two dozen). There is no gender, no height, no facial expression, no way of moving that Atkins doesn’t seem able to capture. As Atkins journeys through Sedona, the play becomes more poetic and profound. Here, more than anywhere, does he stretch the limits of possibility. The wonderful job by the light and sound team, as well as a giant backdrop of a moving, mirrored wall enhances these sensations. The play could have worked well without these technologies, but they complimented Atkins’ energy and abilities, adding professionalism. I was pleased that this production raised questions without trying solve them. There’s nothing preachy or judgmental here. There are plenty of laughs and Atkins represents a legitimate, sane perspective. The play serves a good starting point for discussion about what belief is and what conditions are required for it to happen. We Are Not Alone plays is at the Segal Centre studio until March 15. See here for tickets and showtimes.